"He's certainly got a lot of tricks." A powerful villain with advanced technology casts a spell on Central City — and when he reveals knowing information about the future and Barry himself, Barry's got to find a way to stop the unstoppable. This was a super episode, fantastic storylines, maybe the best since Gypsy's first appearance. And what an opening! But also how unexpectedly gruesome. Granted it's a pretty bloodless death, but drowning while absolutely terrified is a horrible way to die. From the beginning it's clear that Abra Kadabra is a ruthless villain... and I think we're also getting some foreshadowing about something to do with tech industries; we'll see if I'm right. This episode has so many themes and storylines. They're woven tightly together and because of that the episode works really, really well. I'm going to try to address the major themes. First, let's talk about Barry, who has to decide again whether or not to sacrifice morality to win. Let's remember this is not the first time he's had to make the choice. Flashpoint, and several episodes before then, showed that Barry was still an adolescent superhero, sometimes willing to put morality up for sale. He's been paying for those choices this season, but this time, he makes a different choice. 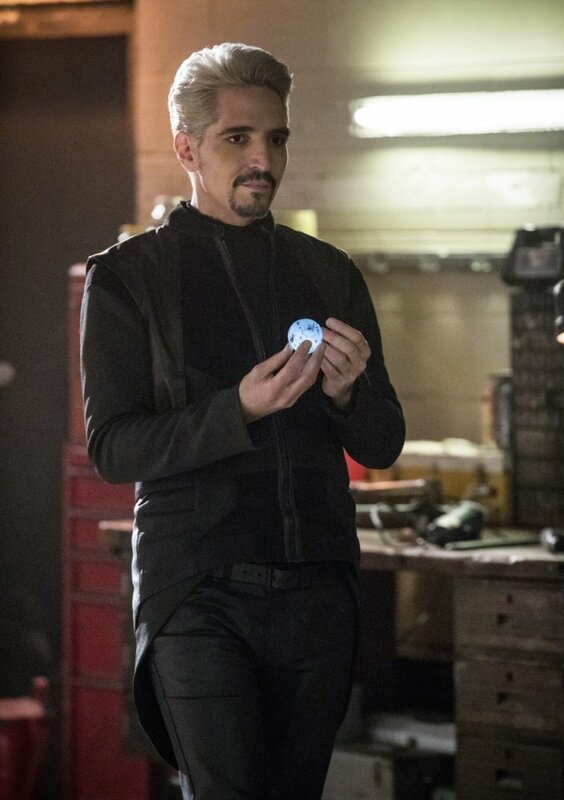 No matter how much he wants to save Iris, he's not going to, not if the price is making a deal with people as dirty as Kadabra. He's going to give away Kadabra to Gypsy, and come up with a solution of his own. I thought his final speech to Kadabra — appealing to a better nature which didn't exist — was passionate and moving. Which leads me to Cisco and Gypsy. Cisco is clearly falling in love with Gypsy, but he senses a wall. From his cheesy come on lines to his attempt to return a recent smooch, she keeps pushing back. It's another man — who was killed by Kadabra years ago. It's Gypsy's focus on earning revenge for the partner she's lost, however, which actually pushes away Cisco, who I thought was going to Troll Doll Gypsy to the ends of eternity. When Gypsy yells at poor Joe, who's desperately trying to find any solution to save his daughter, she's actually yelling at herself, I think, because she sees how her own obsession is cutting off something which might be really good — a relationship with Vibe. Unfortunately Joe's moment of weakness led directly to what was for me the hardest part of the episode: Caitlin Snow performing surgery on herself through Julian, and the etcetera. (Yes, it's so painful I can barely etcetera.) But my god, Julian when the walls fall! When he saw Caitlin hurt it was like they were falling in love all over again. They connected on a deep enough level to save Caitlin's life — they made a deep, powerful connection — Julian made confession after confession — and then that moment when Caitlin's joking with Cisco and hesitates, and Cisco looks up. And. If the following scenes brought to mind a scene from Angel where a woman named Winifred Burkle found her body taken over by an alien substance, and she wound up dying and transforming in the arms of the man she loved, well, I thought the exact same thing. There was something very painful and Joss Whedon about the moment, two people being pushed together then being pulled so very far apart. I want to reiterate that part of me is struggling with the Killer Frost storyline. I feel there has to be more going on here. Caitlin has powers, but we know that powers themselves do not make you evil. Yes, Caitlin became Killer Frost in Flashpoint, but the ones who became evil all had their powers awakened by Savitar, didn't they? And I think it's been established that Caitlin's powers came from the particle accelerator. Then the other part goes... but.... not only was Caitlin Killer Frost in another dimension, she was also Killer Frost in Flashpoint. And then the first part goes — but everyone else who has had their powers transferred from Flashpoint did it because of Julian and the stone, and that's not the case for Caitlin in this dimension. She acquired her powers from the accelerator. And then I think — who took off the necklace? Julian. Caitlin decided to die rather than be evil, a choice he if anyone should be able to respect, but her choices are taken from her — and in the moment of her death she transforms into the thing she preferred to die rather than become. It's a puzzle, and I only hope the writers have a plan to explain it. But we are left with a powerful, malevolent creature who may or may not be Caitlin. Or Killer Frost. We'll find out soon, after the show hiatus. I love the Hamilton reference! I felt like there were lots of allusions to comics tonight, some of which I caught, some of which I did not. Stagg Industries was mentioned, and it seemed important. Kord Industries came up, and I'm fairly sure that's a reference to the character Ted Kord, the secret identity of another DC hero, the Blue Beetle. Kord Industries has also been referenced on the show Arrow. I absolutely loved Kadabra's special effects. Maybe my favorite villain powers so far. 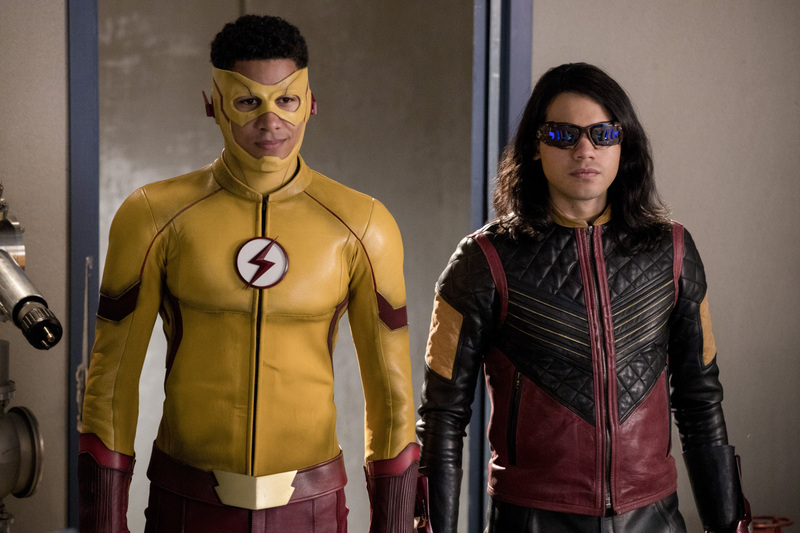 Vibe, Gypsy, Flash and Kid Flash. Very cool superpowered team, lots of exciting action. Barry's solution to Kadabra involved running fast, yes, but also a measure strategy compared to other fights. Did anyone notice his eyes glowing when he caught up to Kadabra's ship? The only thing I truly did not like about this episode was Iris, who has a good moment or two with Joe but is otherwise busy being Princess Toadstool. Look, Barry's biggest clue in the future is... newspaper headlines. And we have... a newspaper writer. Surely the writers can think of something Iris can do with her skills and talent? Sometimes Iris gets to be an empowered woman, but sometimes not. Kadabra: I don't think so. It's frustrating isn't it, knowing that you're going to die unless I give The Flash what he wants. All that power, all that speed, and yet you're still slow. Joe: This isn't a game or a trick. This is about my daughter's life. Kadabra: And it's my life if you hand me over to that collector. It's simple. Let me out, and I'll tell you who Savitar is. Give me to Gypsy, and Iris dies. Cisco: Looks like things between you and Julian are a little frosty, huh? (Caitlin glares) It's too soon for the cold puns? Barry: I have nothing to offer you. No reprieve. No escape for what you're facing. You've done some terrible things. But you are still a man. You have a family, friends, people that you care about. Somewhere inside of you there must be a glimmer of light, of hope. It's that part of you that I'm asking. I'm begging. Help me save her. Did they ever reveal Gypsy's real name? Because I keep wanting for her to admit her name is Francesca Ramon. So that Cisco actually date his female version from another Earth. ;) But maybe that's just me. For all of the troubles the Flash is having from preventing a bad future I just can't fathom why he just doesn't ask his time traveling friends from the Waverider for help. They should really work together more. Maybe the death of Iris is an aberration they could fix. I'm with you totally in all things regarding Caitlin in this episode. Stagg Industries has to do with Metamorpho's (a fun superhero) evil father-in-law, if remember the comics correctly. And you're right about Kord. I'd love to see Ted as Blue Beetle in the Berlantiverse!